Big Wheel Building: Bonk story. I was new to the area and had gotten a good feel for the trails, but wanted a little more than just a trail ride this day. Fall had weeks before bled into winter, snow was on the ground even in the valley, and I had an itch to explore something new. I had the night off from the restaurant, and knew that I wanted to be out for 6+ hours of on-the-bike moving time. No agenda otherwise. Started with a decent climb on dirt, a much bigger climb on pavement, then an hour or so of short, semi-steep rollers before coming to a T. Headed left since that seemed like it went away from home (still only ~2.5 hours into the ride) and cruised through a little community at a 4 way stop. Noticed a building with the word 'store' painted on it, but didn't need anything so I kept on going. Climbed gradually on pavement then steeply on dirt/plowed snow for another 2+ hours. Hadn't eaten anything as was my habit those days--didn't even bring any calories along with. After climbing for the better part of 5 hours, and topping out at what I guessed was close to 9,000', it became obvious that there was more dirt/snow road and trail to explore, but that I was at the high point and all roads headed down. I'd been in such a great groove climbing new terrain that I'd lost track of time, and was suddenly feeling a lot less spunky than I should have, considering how far I still was from home. Backtracked down the steep plowed road. Got back to the little store at dusk, clipping out of the pedals for the first time, I'm fairly certain, since I'd left home almost 6 hours before. Suddenly became aware that my fine motor skills weren't quite as sharp as I had expected they would be. I stumbled on the smooth pavement after leaning the bike, caught my toe on the threshold when stepping through the door, then fumbled to get my glasses off as they steamed upon entering the heated building. Dropped my gloves as soon as I'd removed them, bent down to pick them up, then when I stood up became acutely aware that the 'emergency dollar' in my back jersey pocket wasn't going to go very far in a store like this. I salivated looking at the cartons of chocolate milk ($1.69--drat), and briefly considered the 'chocolate' covered mini-donuts at two packs for a buck before my addled brain remembered that sales tax might or might not be an issue. Then I wandered closer to the cash register and saw salvation in a plastic tub: Red Vines. The shopkeep had marked "5 cents each" with a sharpie on the top of the tub. Bingo. 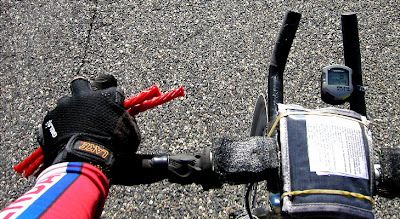 It should have been just this simple: Count out 20 licorice whips, hand the clerk my buck, saunter outside with a mouthful of corn syrup, wheat flour, and that staple of the endurance cyclists diet: Red 40. But it didn't quite happen like that. For starters, my fingers were still lifeless and couldn't find the folded dollar bill in my middle jersey pocket. After much struggle and contortion (to the continued amusement of the cashier, I'm sure) I finally dug it out and held onto it like a prize. But then I simply could not figure out how many nickels there were in a dollar. My face burning red, partially from wind and partially from shame, I stood there and tried for all I was worth, first subtracting from a dollar, then trying to multiply by .05. Even counted on my fingers but couldn't get to the end of them before I'd forget where I'd started. Frustrated, bonked, miles from home in a strange place and with the sun already below the horizon, I finally gave up. I stumbled over to the cashier, placed the crumpled buck in front of her and stammered: "I have this". Then pointed at the tub and demanded, "How many of those can I have?". I think she'd been watching me since I walked in and had a sense for how hypo-glycemic I was. She quickly walked over to the tub, shook open a brown paper bag, then filled it with a fistful of licorice and told me I was good to go. The licorice was stale and difficult to chew, but it still provided the calories I needed to snap out of my stupor. The descent was toe-numbingly cold, but the best was saved for last. About two miles from home, soft pedaling along a descending false flat in the dark, something felt strange on the bike. I looked down while spinning and saw (in the lights of a following vehicle) ball bearings falling out of my bottom bracket shell. Had a momentary flash of 'What if that had happened way the hell out there while I was bonked?' before I rolled to a stop on the shoulder. Clipped out of the pedals and just walked the bike the last two miles, happy to be walking, happy to have some calories in my gut, happy to be living in a new place with new things to explore. And feeling especially lucky that it had all worked out the way it did. I think that counts as interesting to all of use who have "been there" in one form or another. My personal fav is the calorie debt shakes: ride long and hard, stop, eat a bunch, then shiver involuntarily for ~10 minutes while the system tries to sort itself back out. Had a good case post-pizza in the Escalante Sinclair two weeks ago. Great read Mike, you are mistaken, (and you know it ;) ) when you say no one but you will find this interesting. Had one of those recently, just about blacked out on the bike. Casey's convenience store saved the day! Gotta love that convenience store grub. Love it. Could not calculate nickles into dollars. Too funny. Good thing shifting the bike becomes a lower brain function. Maybe that explains SSrs! I know this feeling all too well. I have weird blood sugar issues anyway. A good buddy of mine and I set out on a good 45 mile ride with like 7000 ft of gain. I had two gels. Big mistake. We made it up and down, but I lost it about 3/4 of the way home, hit the wall, etc... There was an old man on a Pewee Herman bike that passed me near my house. I was in my granny on the flat just letting the weight of my dead legs fall on the pedals. I just wanted to pull over and die in the ditch. I got home, dazed, running a high fever. I slept it off. I'll NEVER do that again, so now I practically carry a three course turkey dinner in my Camelback!